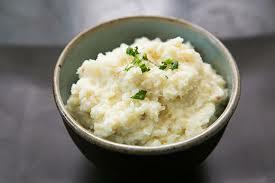 Put the potatoes and celery root in a large pot with 1 teaspoon of salt and water to cover. Bring to a boil, reduce to a strong simmer, and cook for 15-20 minutes, until both vegetables are fork tender but not mushy. Meanwhile, heat the olive oil in a sauté pan over low heat, add the shallots, and sweat for about 8 minutes, until soft. Remove from the heat and set aside. Drain the potatoes and celery root, reserving cooking liquid and transfer cooked veggies to a mixer fitted with the paddle attachment or use a hand masher for lumpier potatoes. Add the butter and 1 teaspoon of salt and mix on low speed, then increase speed to medium to mix thoroughly. If mix seems dry and stiff, add small amounts of reserved cooking liquid or some milk. Season with the pepper and additional salt if needed. Stir in reserved shallot and serve hot.